SUPATILE DIT is a prefinished drop-in ceiling tile system that combines good looks with rapid installation into T-bar grid for full access to services in the ceiling cavity. 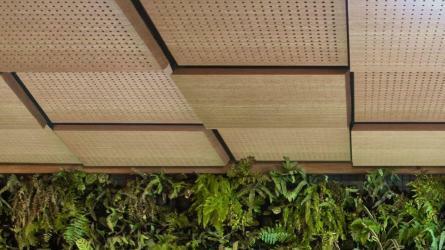 This product offers an exciting and creative alternative to traditional ceiling tiles. SUPATILE DIT is the ideal refit solution as you can easily keep the existing grid and totally transform your space with a simple upgrade. Simply remove the old tiles and replace with SUPATILE DIT to achieve refreshed visual appeal and design flexibility with cost effective, rapid installation. SUPATILE DIT comes in our SUPAFINISH laminate concept timber veneers and colours. This is durable, easy to clean and has zero VOC emissions. The tiles also come in a range of aesthetically attractive acoustic patterns giving you the added option to easily eliminate noise reverberation problems in an area with a simple upgrade. Finishes and patterns can be mixed and matched. Denote certain areas by simply changing the finish or pattern of tiles in one area to contrast with the other parts of the ceiling. In the future if you get tired of this configuration just lift them out and rearrange them. SUPATILE DIT’s great looks combined with ease of specifying, installing and access into the roof cavity has meant it has been selected by leading designers in many projects throughout Australia. SUPATILE DIT Flush – The most economical ceiling tile in the range, this is designed to sit flushwith the T-bar grid system leaving the full 25mm grid exposed. SUPATILE DIT Rebate - The matching edge rebate on these tiles creates a 25mm recessed shadow line for a tegular look. SUPATILE SLAT is a fully accessible slatted ceiling system that fits into the traditional exposed two-way T-bar grid to combines the popular look of timber slats with the easy access and installation of a ceiling tile. SUPATILE 3D is the new, fully customisable 3D ceiling tile system that vastly expands your design options while simplifying installation and eliminating the potential for cost over-runs. 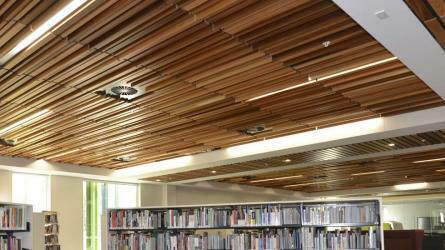 Many SUPATILE options can be used in existing ceiling grids without the expense of moving anything. This makes them ideal for refurbishments as well as new fitouts. This product range is available in creative acoustic patterns or slat configurations in contemporary timber and colour finishes and can achieve a directional effect and provide atmosphere to an overall fitout.